IMAGE: Finance Minister Arun Jaitley with RBI Governor Dr Urjit Patel. 'This government has shown complete lack of confidence in the RBI governor, in the RBI setup,' says former finance minisyer Yashwant Sinha. Reserve Bank of India Deputy Governor Viral Acharya's October 26 speech brought to the fore a serious standoff between the government and the central bank. 'Governments that did not respect the central bank's independence would sooner or later incur the wrath of financial markets, ignite economic fire, and come to rue the day they undermined the regulatory institution,' Dr Acharya said in a hard-hitting speech. 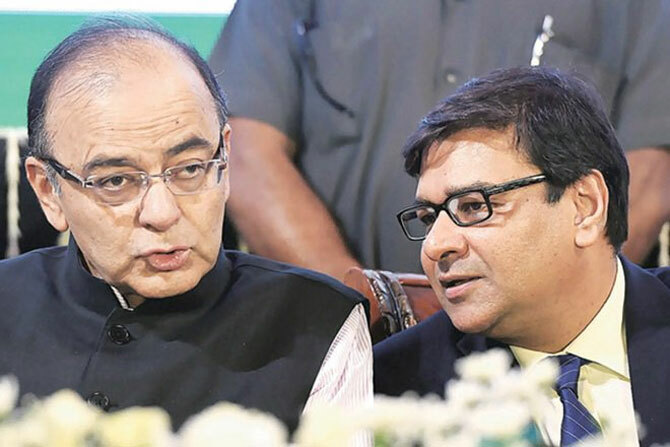 Union Finance Minister Arun Jaitley's statement a couple of days later, blaming the RBI for the exponential rise of non-performing assets, or NPAs, added fuel to the fire. The Opposition was quick to attack the Bharatiya Janata Party-led National Democratic Alliance government for 'undermining the autonomy of institutions like the RBI'. Former finance minister Yashwant Sinha tweeted that this government was 'hell-bent on destroying the RBI'. "The way out is for this government to go, and this governor to go. Then only peace will return to the RBI," Sinha tells Rediff.com's Utkarsh Mishra. What in your opinion is the main reason for the current standoff between the RBI and finance ministry? After all, governmental interference is as old as the hills. What changed now? This is an unprecedented situation. For a government to issue a directive to the RBI is clearly an unprecedented situation. It has never happened in the past. The government has shown complete lack of confidence in the RBI governor and in the RBI set-up. And therefore, the governor has no option but to resign. Won't his resignation make things difficult for the RBI and give the government a free hand to do whatever they want? They (the government) might succeed for the time being. But ultimately their evil designs will be defeated. And the governor, as I have already said, will save whatever little reputation he is left with. There is an old English saying, 'even the worm turns'. So the worm has turned. The same thing happened in the CBI (Central Bureau of Investigation). In your view, why is the government invoking Section 7 of the RBI Act, empowering the government to issue directives to the central bank? What effect will it have on the RBI? It completely destroys the RBI's reputation. It destroys the RBI's autonomy. It should never have led to a situation where the government had to use Section 7. It is a complete failure of the government to convince the RBI governor of their point of view. Was Dr Acharya right in airing differences between the government and the RBI in public, in the manner he did? After the government issued the directive, what option did the governor or the deputy governor have? Well, Jaitley is lying through his teeth. The point is, you go back to the Economic Survey he presented to Parliament in 2014. And what did he say there? That NPAs are Rs 2.14 lakh crore. And now he says it is Rs 8.5 lakh crore. Didn't he mislead Parliament (in 2014)? And why did he have to wait all these four years to come out with this statement? Even a person like me was surprised when I read the Economic Survey. Because he (Jaitley) bailed out his friend (P) Chidambaram in that Economic Survey, and did not say a word about the mismanagement of the economy by the UPA (United Progressive Alliance) government. Now he has suddenly become wise after four years. He is telling all lies. And if there's one person who should quit, it is the finance minister, because he has messed up the economy. He has messed up the relationship (between the government and the RBI). He deals with everything except finance. What is the way out for the RBI now? The way out is for this government to go, and this governor to go. Then only peace will return to the RBI.